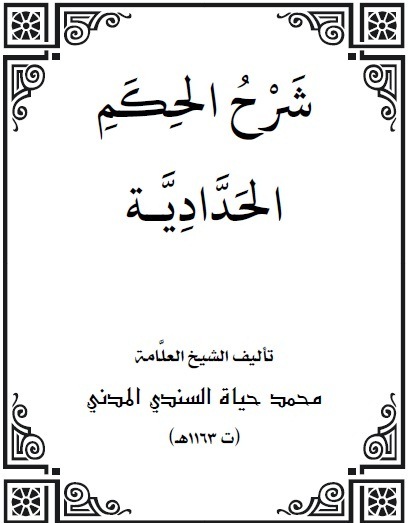 Shaykh Nizar Hamadi from Tunisia was kind enough to recently send me an electronic copy of his editing of a commentary on Imam al-Haddad’s Hikam collection; the commentary being by none other than Shaykh Muhammad Hayat al-Sindi of Madinah al-Munawwarah. 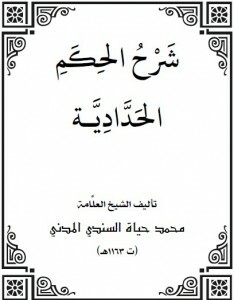 Some of you may have noted that his name is cited as one of the Shuyukh of Shaykh Muhammad bin Abd al-Wahhab; and that we have previously presented on this site a brief extract from Shaykh Hayat al-Sindi’s commentary on the Hikam of Imam Ibn Ataillah. It goes without saying that thanks to these two commentaries on the Hikam works we can clearly see that the methodology and views of the teacher and student vary significantly. Shaykh Hayat al-Sindi’s approach in his commentary is to unpack the and expand on the words of Imam al-Haddad without extensive discussions, an example of which is presented below. Finally I would like to extend my thanks to Shaykh Nizar Hamadi for his tireless efforts in editing publishing works on traditional Islam which highlight our rich scholastic heritage. Second: Striving towards Allah upon the path of uprightness, which is like cultivating the earth and taking care of what it needs from seeds, weeding, protection and warding off that which would harm it etc. Thus cultivating the earth without watering it is stubborness and effort without result, and watering it without cultivating it is a waste. Tawfiq from Allah is like the rain, the servant has no say in it, and this is the reality (haqiqah). The striving and effort which is like the cultivating of the earth and looking after it is for the servant, which is his action regarding which he will be questioned and compensated. And this is the shariah. Second: Striving towards Allah – Who ordered His servants to strive towards Him– upon the path of uprightness,- which is the Muhammadan way, without any shortcomings and deviation in the principles (usul) and branches (furu)– which is like cultivating the earth – which grows crops by the mere falling of rain upon it– and taking care of what it needs from seeds,- which is the material source of cultivation– weeding, protection – from that which harms – and warding off that which would harm it- which will not facilitate growth– etc.- which are required for cultivation. Thus cultivating the earth without it being watered is stubborness and effort without result,- as the earth does not grow crops without water– and watering it without cultivating it is a waste.- as it does not grow without being cultivated. Please note: This is a rough draft which is under review. This is really a profound and beautiful statement in all its conciseness. I would think that if a Muslim needed 10 things only, this would be one. Success will only come with effort, and efforts themselves need guidance. If we will work with Allah in the Unseen, in this manner, insha Allah we will be successful. Jazakum Allahu Khair for sharing.